The Earth actually has a number of north poles, and all of them are not at a fixed point. The Earth rotates towards the east, leading to periods of days and nights. The points at which the axis of rotation intersects with the surface of the Earth is called the geographic north pole and the geographic south pole. At the south pole, there is a land mass, while the north pole has drifting ice sheets. The exact location of the geographic poles, also known as the terrestrial poles is not constant. It wobbles by a few meters, following some regular patterns, as well as an irregular pattern. The geographic poles are also referred to as the “true” poles. Apart from the geographic poles, there are the magnetic north and south poles. This is where the compass needles point towards at any given point in time. At the magnetic north pole, the compass points straight down. When early compasses were invented, the end that pointed to the north was marked with an N. Eventually, scientists figured out that the needles were attracted to the opposite poles, but the convention stuck. So compass needles point to the magnetic north pole, which is actually the south pole of the magnetic field of the Earth. 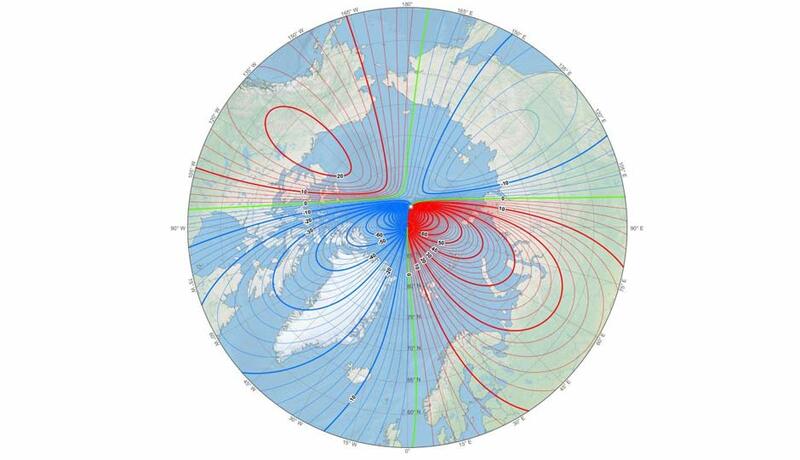 Imagine a line between the magnetic north pole and the magnetic south pole. This line is at an angle of about eleven degrees to the axis around which the Earth rotates or a line between the geographic north pole and the geographic south pole. Now, the line between the magnetic north pole and the magnetic south pole is not a line that passes through the centre of the Earth. This means that the magnetic north and south poles are not located exactly at opposite sides of the Earth. The distance between the magnetic north pole and the geographic north pole is about 500 kilometres. The distance between the magnetic south pole and the geographic south pole, is much more, at 2,858 kilometres. If you were actually standing at the geographic north or south pole, your compass would still point towards the magnetic poles. At the magnetic north and south poles, the compass needles would try to point downwards, attempting to follow the magnetic field lines. Additionally, the north pole keeps drifting, whereas the south pole is more or less stable. In the early part of the 20th century, the north pole was drifting at the rate of about 9 kilometres per year. The rate of the drifting started accelerating in the 70s, and now the north pole moves at the much higher rate of 41 kilometres per year. 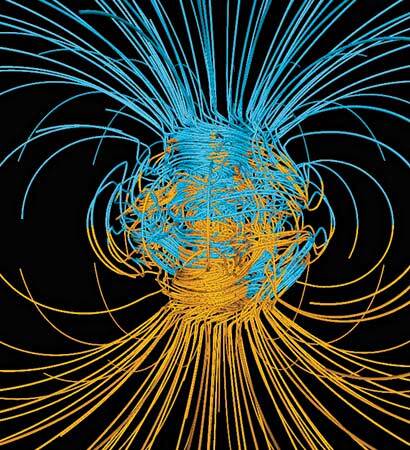 Why the Earth sustains a magnetic field is somewhat of a mystery. Very early in the formation of the Earth, when the surface was not a solid crust, Earth did not have a magnetic field. The magnetic field emerged only after the Earth had cooled enough. Now the molten plasma at the core of the Earth should have dampened the magnetic field within a few thousand years, but the Earth continues to have a magnetic field for reasons that are not yet entirely understood. Researchers suspect that the reason lies in the outer core, which is a swirling liquid mass of magma, rich in iron and nickel. This liquid ocean is churned because of the rotation of the Earth, giving rise to the magnetic field of the Earth. These subsurface currents are hundreds of kilometres in width and thousands of kilometres in length. The strength of the magnetic field would increase, if the Earth rotated faster, or had larger volumes of liquid magma in the outer core. The strength of the Earth’s magnetic field is reducing by about 5 percent every hundred years. Over the course of thousands of years, the polarity of the Earth’s field also changes. This means that the magnetic north pole and south pole exchange positions. In the last 76 million years, there have been 170 reversals, with the interval between the reversals increasing. Currently, this period is around 300,000 years. The last reversal happened 770,000 years ago, so we are overdue for a reversal. As you can see, there is no bar magnet inside the Earth generating the magnetic field. But imagine there was one. The north and south poles would be at antipodes, on opposite sides of the Earth, and the straight line between the poles would pass through the centre of the Earth. 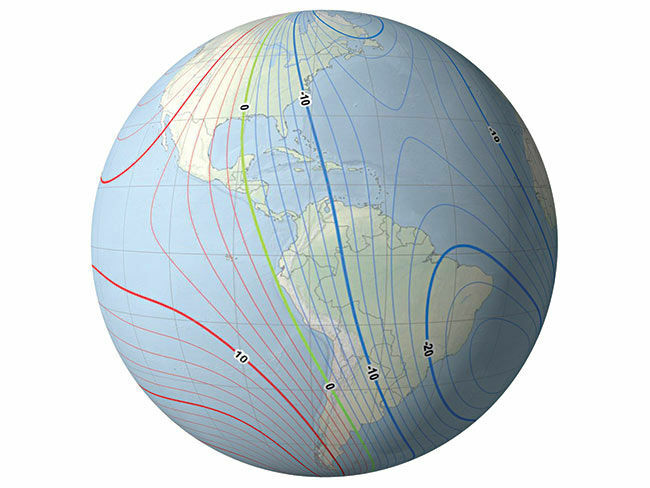 The geomagnetic north and south poles are the points on the surface where the axis of this hypothetical dipole intersects with the Earth. 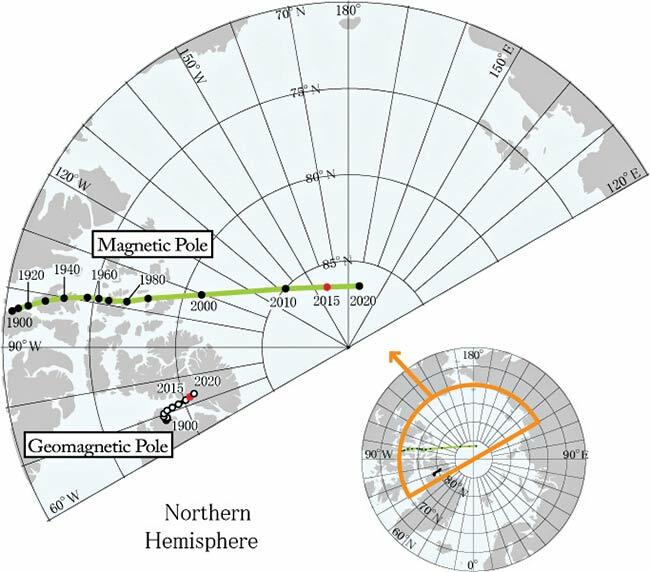 The geomagnetic north and south poles also drift, but the reduced movement of the magnetic south pole dampens the movement of the geomagnetic north pole in comparison to the magnetic north pole. For a range of military and civilian applications, including navigation on smartphone apps, the USA based National Oceanic and Atmospheric Administration (NOAA) maintains what is called the World Magnetic Model (WMM). The model is used to orient ships, aircraft, satellites, antennas, drilling platforms and mobile handsets, among other things. These devices or equipment use a compass, and align themselves along the direction of the magnetic field. The angle by which this alignment differs from the geographic north is called the declination. At some points on the Earth, the declination is a positive value, while at others, the declination is a negative value. In some places, the declination is zero, which means that the compass is actually pointing at the geographic north. The WMM provides declination values for any point on the surface of the Earth and extends to 1 kilometre below the surface, and 850 kilometres above the surface. A model of the Earth’s magnetic field. Three satellites of the European Space Agency’s Swarm mission are used for measuring the magnetic fields of the Earth, the measurements are then used to update the model. As the rate of movement of the magnetic north pole is accelerating, the model needs to be updated more frequently as well. Usually, this model is updated every 5 years, and the currently used model was called WMM2015 and was released in December 2014. This model was expected to be current till 2020. However, in 2018, the NOAA released an update, a version 2 of the WMM2015, because the WMM2015 model was showing a degraded performance in the higher latitudes, particularly for vessels operating within the Arctic circle. Another update was scheduled for January 15, but that did not happen because of a government shutdown in the USA. The version 3 update for WMM2015 was then delayed to January 30. A version of this model is embedded within smartphones, and applications can obtain information from it when required. In the lower latitudes, the drifting magnetic north pole does not really affect the devices much. Although the lifetime of the existing models ends in 2020, the devices using the older versions are expected to be accurate beyond that time as well. The accuracy will deteriorate every year, but future versions of operating systems are expected to be updated with newer iterations of the WMM. The NOAA website is back online now, where you can read more details about the out of cycle update for the WMM.